Call us at (609) 654-2800 today. physician and owner of Ultimate Eye Care will celebrate his 30th year in practice this summer. Dr. Frank is licensed to practice in New Jersey, Pennsylvania and Florida. He is a past president of the Southern New Jersey Optometric Association. Dr. Frank is both therapeutically certified as well as licensed to prescribe oral medications in the state of New Jersey. Dr. Frank operates two offices both in Medford and Vineland, NJ. Dr. Frank and his staff in both locations strive to make each patient experience a unique blend of excellent clinical expertise surrounded by attentitive customer service. 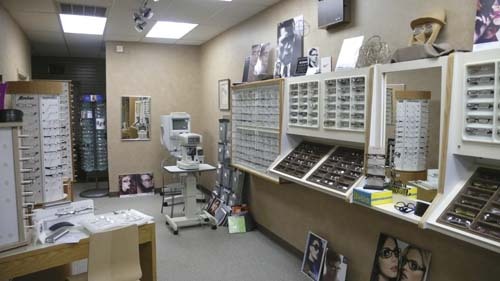 His offices offer the latest in contact lens care, comanagment of surgical eye care (such as Lasik, cataract and retinal surgery) and beautiful optical boutiques with unique affordably priced eye wear. Dr. Frank accepts most insurance plans including Medicare, VSP, Horizon, Aetna and AmeriHealth. Please call our office with any questions or to schedule a convenient appointment. Saturday and evening hours are available. At Ultimate Eye Care, we are dedicated to providing high-quality optometry services in a comfortable environment.Call us at (609) 654-2800 or schedule an appointment today online. "Dr. Frank has a unique sense of style – it never ceases to amaze me how I can spend an hour trying on just about every frame in the store and he'll walk over and pick out the perfect pair in a heartbeat. He's very direct and funny, which I appreciate. And he's a fine optometrist. Very nice selection of frames, not what you'd expect in small-town NJ."